Landscape Oil Painting Demonstration - "Truckee - Early Spring"
Nationally recognized, award winning artist Mike Callahan is a fourth generation Nevada native who counts himself privileged to grow up in what he believes to be one of the most beautiful places on earth, the eastern Sierra Nevada mountains near Reno, Nevada where he still lives today. 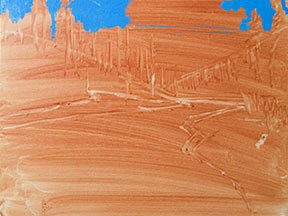 While he has been painting since childhood, he has only been painting in earnest for about the last 5 or 6 years. 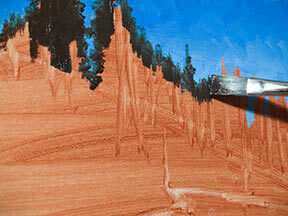 However, if you look through the paintings on Mike’s website, you will quickly see that the Sierra landscape isn’t the only subject Mike typically paints. 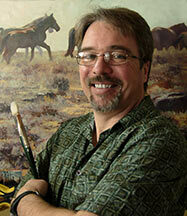 He also enjoys painting Western themes as well as figurative and portraits. 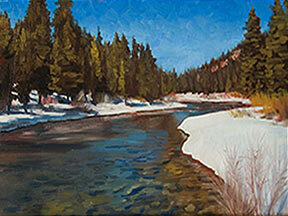 As you look at Mike’s work, you will notice a great color harmony throughout. 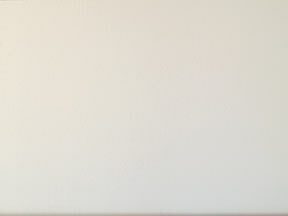 While the colors in his paintings run the full spectrum of color seen in nature, harmony is maintained by Mike limiting himself to only three colors plus white on his palette. Instead of referring to this as a limited palette, Mike thinks of it as an unlimited palette as he has not found any color he desires to use that he can’t create from those primary colors. 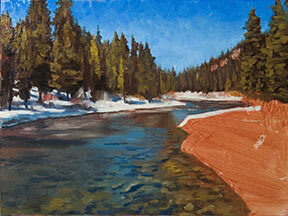 Please click here to visit Mike’s website to learn more about him and to view more of his work. 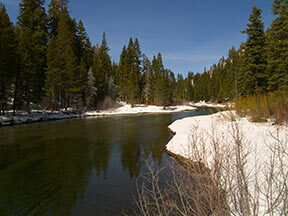 I shot this reference shot of the Truckee River in early Spring not too far from Tahoe City. There hasn’t been much snow, but even if there had been, it’s too early for much run-off and the river usuallly runs pretty slow this time of year. I really liked the meandering feel so I decided to do a painting…this is my progress. 1.) 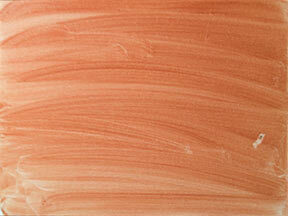 I prepped my canvas by toning it with a burnt-orange color mixed quite thinly with Turpenoid as I usually do. 2.) 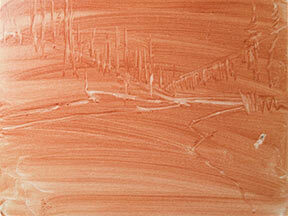 I also loosely sketched in my major elements as I typically do. 3.) I immediately begin to paint in my sky right on top of the still-wet under paint, making sure to use plenty of my medium which is a mix of alkyd, walnut oil and Turpenoid. 4.) 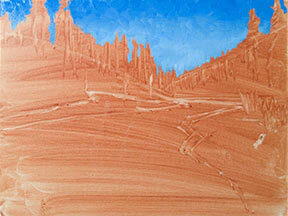 I mix a lighter color of the sky and paint it in as well, mixing about twice as much color as I think I’ll need. I’ll explain in a moment. I leave a rough outline of my trees. 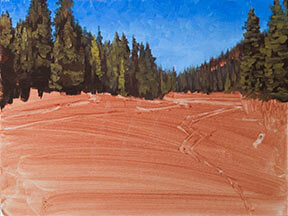 I actually try to overlap the area where the trees will be a little. 5.) I follow by laying in the dark areas of my trees and as you can see in the photo above, I allow the portions that cross into the sky to mix pretty freely with the sky color. This is because trees aren’t solid and a lot of the sky shows through their boughs causing the eye to average the two colors…not uniformly of course, but roughly overall. 6.) As things receed from you, they have a tendency to lose color saturation. They also seem first to lose yellow from the full spectrum of light, then red. This is because atmoshphere filters those two colors in that order as reflected light passes through it. That’s why mountains in the distance appear purple and then very far off, blue and lighter as they go. Since I’m working with paint, I can’t subtract color out of my paint, I can only try to approximate what the eye sees, so I can lighten and add blue to the receeding parts (like subtracting yellow and red and desaturating) by adding the extra sky color I mixed up to the dark color of my trees as they recede. 7.) 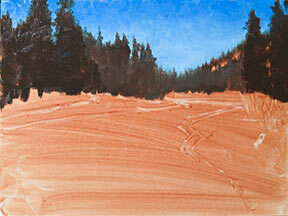 I’m constantly thinking in terms of two values, so now I paint my lighter value of the trees. Once again, I mix sky color into the trees I want to recede an mix a more saturated color for the closer trees that are being hit most directly with sunlight. 8.) I now paint the left bank of the river (and the far away right bank) – I typically work from left to right because, as a right-handed naturally un-coordinated individual, I would be smearing paint all over if I did otherwise. 9.) 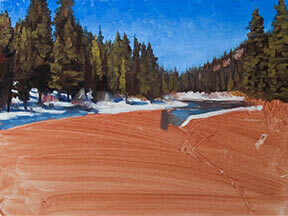 It’s now time to paint the river. I begin with the furthest section away (just because it nearest the top of my canvas) and work forward for the same reason stated in the last step. 10.) 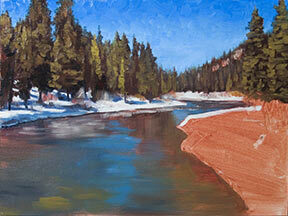 I block in all the major color areas of the water. I wanted to see more of the river bottom than is showing in my original reference, so I looked at another reference photo I took near the same area. 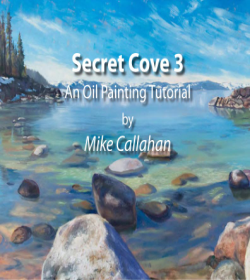 Want more of Mike Callahan’s oil painting insights? Great work of art. I love the way how you mixing up the colors to create such an amazing result.